While everyone is looking up for something on the lines of ‘Roja’, this comes straight out of ‘Alaipayuthe’. A Marriage proposal in Maniratnam style. Azhagiye ! IAF Squadron Leader Muthukumar’s love combines with Rahman’s flavor. Let’s jump swiftly into the song. A young cluster of Army men with guitars in gala mood chanting in chorus for the Hero’s love. That’s how it begins. The feet don’t stop tapping until those Punjabi lines and Jonita’s hum occur, which were added rahmanically to aid the scene. From there the maestro raises the dose of romance a bit. Then the pep is back when he finally ends the tune on a high with the chorus of Haricharan and Arjun while Jonita lights it up in the background. And the winner here is.. Madhan Karky. Yes, with no qualm. 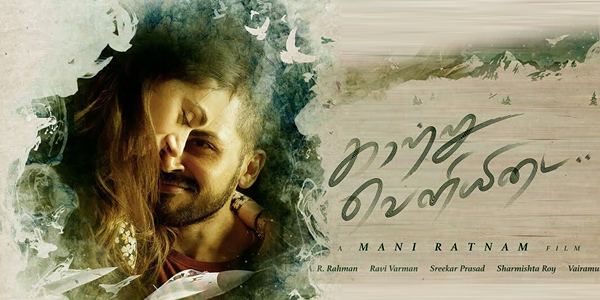 Reuniting with the ManiRatnam-Rahman combination after Kadal, Karky has delivered this first single with finesse. The English lines that he has clubbed to it mirrors the Hero’s character. His character sketch must be that of a Smart Urban guy just like many other Mani films. Take nothing away from the Tamil lyrics. I can’t even remember the last time I heard a stylish proposal number from this combo. That’s it.. Karthi is pleading here, “Azhagiye.. marry me marry me Azhagiye… Kadhal vandhaal maatram vandhaal Call adi ..” . Hope Aditi’s reply comes by in the next single !